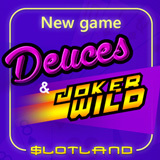 If you're one of those slots players that likes to switch it up once in awhile and play a little video poker, you'll be happy to hear that Slotland has just added a fourth variation on the popular casino game, Deuces & Joker Wild. Until Saturday, you can get a $10 freebie and up to 40% deposit bonus to take it for a spin for free. Both bonuses are valid February 17-20 only. Deuces & Joker Wild is a standard one hand video poker game played with 52 cards plus a joker. With four deuces and one joker wild, it’s possible to have five wild cards in a hand. With so many wild cards players have lots of flexibility in building a winning hand. Payout for some hands is much higher than normally found in a video poker games. For example, five Wilds with a max bet placed wins 2000X the bet. A Natural Royal Flush pays up to 800X. Like the other new video poker games – All American, 10s or Better and Joker Wild -- this new game has a Double Up bonus round. After every win greater than the amount bet, players have a chance to double their win by picking a card higher than the dealer’s. Dueces & Joker Wild players can bet one to five coins per hand and coins can be valued at $.10 to $5 for a minimum bet of $.10 and a max bet of $25. Slotland, which recently celebrated its 17th anniversary, now has 39 one-of-a-kind casino games. Since the unique casino creates its own games, none of them can be found anywhere but Slotland.eu.